A detached lodge situated within Kingford Forest Park, close to the village of High Bickington. It houses two bedrooms and can sleep up to four people. 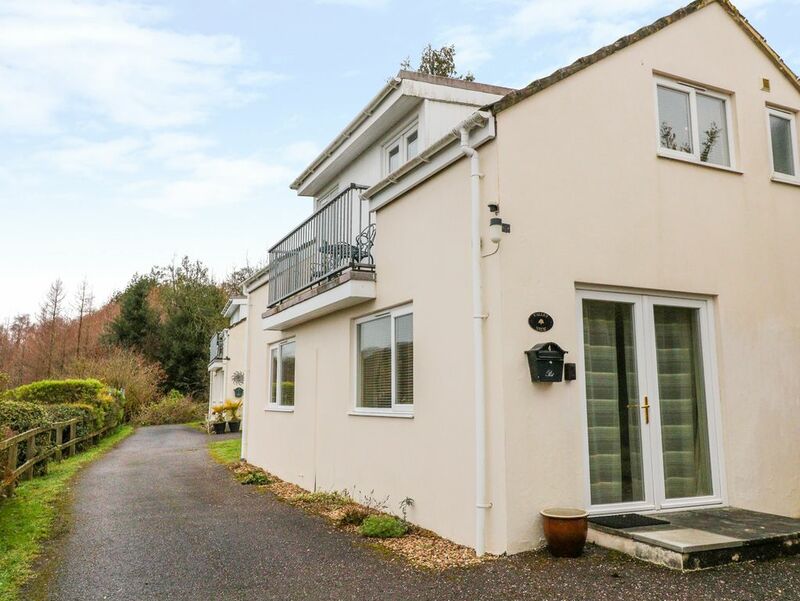 Valley View is a detached property situated within the Kingford Forest Park, close to the village of High Bickington. Inside, you will find two bedrooms comprising of a king-size double bedroom and a twin bedroom, each with an en-suite and balcony. There is also a ground-floor WC with hand basin. Completing the interior is an open-plan living room with a kitchen area, dining area and kitchen area. In addition to two balcony areas, guests will have use to a private patio are with seating and use of shared grounds. Valley View promises a fantastic family holiday. Amenities: Gas central heating. Electric oven and gas hob, microwave, fridge/freezer, dishwasher, TV with Freeview, DVD, selection of books, games and DVDs. Fuel and power inc. in rent. Bed linen and towels inc. in rent. Off-road parking for one car. Private patio with furniture. Shared use of grounds. One well-behaved dog welcome. Shop 2 miles, pub 1 mile. Note: Children to be supervised due to balcony off both bedrooms. Region: Devon, with its quiet country lanes, patchwork of lush green fields and sleepy villages is not to be missed. Stately home lovers will be spoiled and why not finish with a scrumptious Devonshire cream tea? Town: High Bickington is a small village in Devon, England. It rests above the Taw Valley and in an area known as 'Tarka country'. Within the village you will find a Post Office, two pubs, a holistic beauty salon and Libbaton golf course. Close by is the village of Umberleigh, where visitors can catch a train along the Tarka Line to Barnstaple or Exeter. Also on the outskirts of the village is a garden of national importance within the town of Rosemoor. Two bedrooms: 1 x king-size double bedroom with en-suite with walk-in shower, basin and WC, 1 x twin with en-suite with bath hand-held shower, basin and WC with extra single fold up bed. Ground-floor WC with basin. Open-plan living area with kitchen, dining area and sitting area. Gas central heating. Electric oven and gas hob, microwave, fridge/freezer, dishwasher, TV with Freeview, DVD, selection of books, games and DVDs. Fuel and power inc. in rent. Bed linen and towels inc. in rent. Off-road parking for one car. Private patio with furniture. Shared use of grounds. One well-behaved dog welcome. Shop 2 miles, pub 1 mile. Note: Children to be supervised due to balcony off both bedrooms.